Hurricane season lasts from June 1 to Nov. 30. 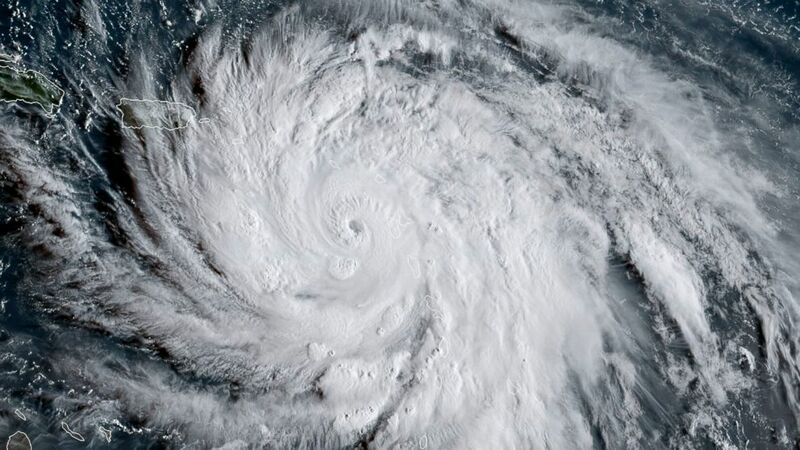 Hurricane season is now underway, and scientists from the National Oceanic and Atmospheric Administration are predicting a near normal or above normal Atlantic hurricane season this year. The forecasters predict a 70 percent likelihood of 10 to 16 named storms with winds of 39 mph or higher. Of those named storms, the forecasters predict five to nine could become hurricanes, including one to four major ones. (Jose Romero/AFP/Getty Images) This satellite image obtained from the National Oceanic and Atmospheric Administration shows Hurricane Maria, Sept. 19, 2017. Hurricanes have winds of 74 mph or higher and major hurricanes are considered to be at least Category 3. An average hurricane season brings 12 named storms, of which six become hurricanes. Hurricane season is from June 1 to Nov. 30. Peak hurricane season is from mid-August through mid-October and the peak date for hurricane season on average is Sept. 10. NOAA will update this year's outlook in early August, just before peak season. 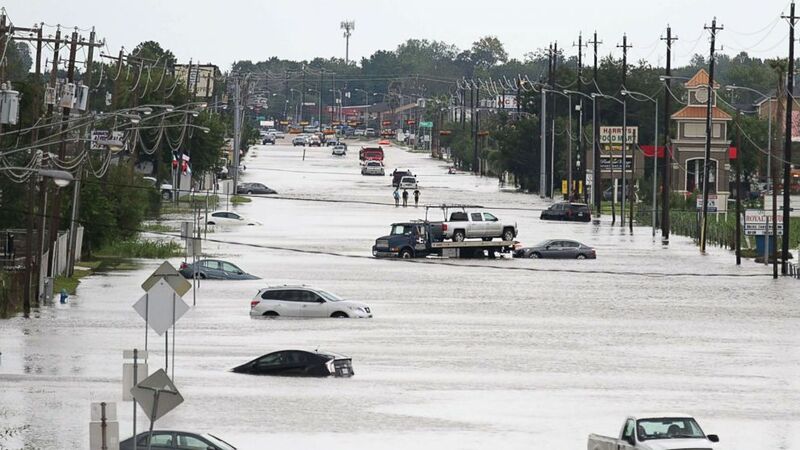 (Thomas B. Shea/AFP/Getty Images) A car gets towed while men walk in the flooded waters of Telephone Rd. in Houston, Texas on Aug. 30, 2017. A group of thunderstorms will feed off the warmth and moisture of the ocean. Air then rises to form more storms and is replaced constantly by the surrounding air. Below all this air rising, low pressure develops. The storm will keep growing as long as it has three key ingredients: 1. Water temperatures at or above 79 degrees; 2. Open water; 3. High pressure above the storm. The combination of high wind speeds inside the storm, the storm's forward motion and the storm surge can lead to a disastrous hurricane. Category 1: Winds from 74 to 95 mph, which can damage homes, trees and power lines. Category 2: Winds reaching 96 to 110 mph. These extremely dangerous winds can uproot big trees, cause serious damage to homes and lead to power outages that last several days to weeks. Category 3: With winds from 111 to 129 mph, Category 3 is considered a major hurricane. Devastating damage can occur, and electricity and water might unavailable for several weeks. Category 4: With winds from 130 to 156, Category 4 hurricanes bring catastrophic damage to homes, trees and power lines and can make areas unlivable. (Mike Stocker/South Florida Sun-Sentinel via AP) This photo shows damaged homes in the aftermath of Hurricane Irma in Sunshine Key, Fla., Sept. 13, 2017. Category 5: Five is the highest category for hurricanes with winds reaching 157 mph or higher. These hurricanes cause catastrophic damage by completely destroying buildings and houses and can make areas completely unlivable. 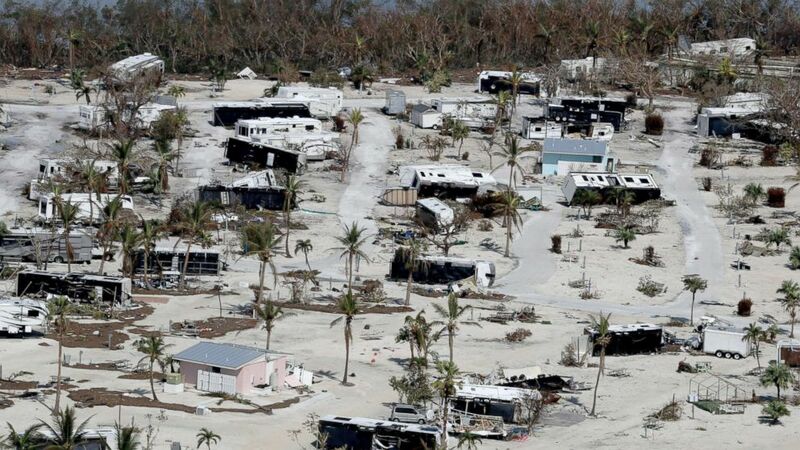 Hurricanes Harvey pummeled Houston in August, followed by Hurricane Irma in the Caribbean and Florida in September, both of which left behind severe flooding that destroyed and damaged homes and businesses. 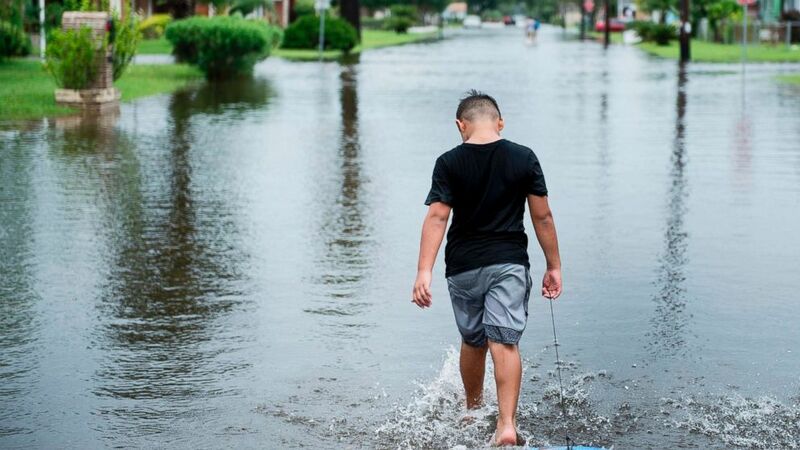 (Brendan Smialowski/AFP/Getty Images) A boy walks with a bodyboard through a flooded street as the effects of Hurricane Harvey are seen Aug. 26, 2017 in Galveston, Texas. 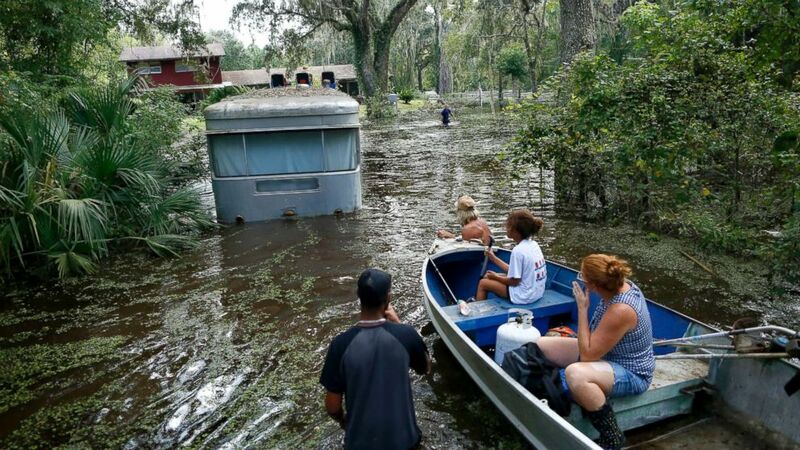 (Brad McClenny/The Gainesville Sun via AP) Family members ride in a small boat as Tony Holt's trailer is pulled out of the flood waters from Hurricane Irma in Gainesville, Florida, Sept. 14, 2017, after Hurricane Irma. 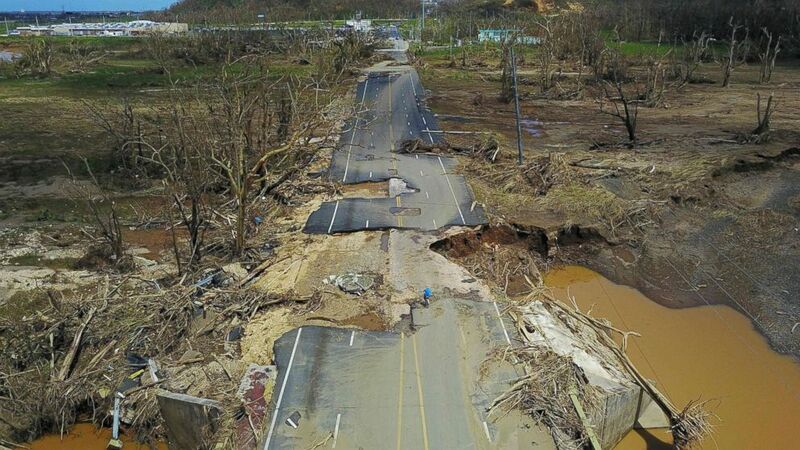 Before the Caribbean could recover from Irma, Hurricane Maria tore through just two weeks later, devastating Puerto Rico as a Category 4 storm. (Ricardo Arduengo/AFP/Getty Images, FILE) A man rides his bicycle through a damaged road in Toa Alta, west of San Juan, Puerto Rico, Sept. 24, 2017, following the passage of Hurricane Maria. Puerto Rico still hasn't recovered from Maria. The storm caused massive power outages and destruction to homes, hospitals and water treatment plants. The Puerto Rico Electric Power Authority reports that 99.2 percent of the island is back on the electrical grid, leaving over 13,000 customers still without power. In an interview with ABC News in March, Gov. Ricardo Rossello said the entire island would have power before the start of the Atlantic hurricane season. ABC News' Ginger Zee, Melissa Griffin and Joshua Hoyos contributed to this report.